Since our family is usually busy during the week with work and school, the weekends mean relaxing and having fun. We love hanging out in the fresh air and letting the kids explore and play. The beach and pool are popular places for the kids to play. Here's an impromptu pic of us right after lunch over the weekend. 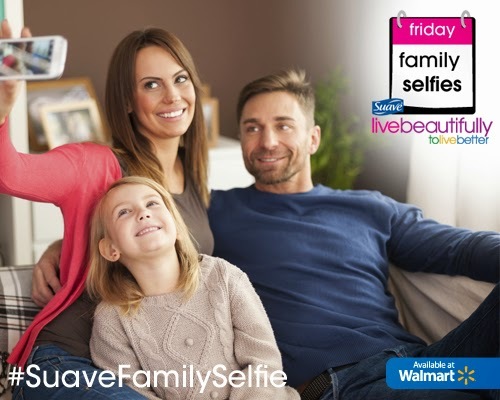 Enter the Suave Family Selfie Contest to win a $175 Walmart prize pack by taking a family selfie photo and posting it to Instagram and tagging it with #suavefamilyselfie #LB2LB #Walmart. Then fill out this form and good luck! How does your family live beautifully? What a fun idea! It has been a while since we have done a family selfie. Definitely going to do this tonight! Love the idea and it sure will be a challenge to get a family selfie but I think it would be fun... thanks for a fun post and what a great sweepstakes..
What a fun program. I don't think we have ever done a family selfie before. I'll have to get everyone together soon for one. we've never done a family selfie. i rarely do selfies myself actually!! I love your family selfie! Very cute! This is such a great sweeps to get family together for a fun selfie! Will definitely try to do this with my family.